Kinder Scout is a moorland plateau and National Nature Reserve in the Dark Peak of the Derbyshire Peak District in England. Part of the moor, at 636 metres (2,087 ft) above sea level, is the highest point in the Peak District, the highest point in Derbyshire, and the highest point in the East Midlands. In excellent weather conditions the city of Manchester and the Greater Manchester conurbation can be seen, as well as Winter Hill near Bolton, and the mountains of Snowdonia in North Wales. To the north across the Snake Pass lie the high moors of Bleaklow and Black Hill, which are of similar elevation. Kinder Scout featured on the BBC television programme Seven Natural Wonders (2005) as one of the wonders of the Midlands, though it is considered by many to be in Northern England, lying between the cities of Manchester and Sheffield. In chronostratigraphy, the British sub-stage of the Carboniferous period, the 'Kinderscoutian' derives its name from Kinder Scout. Kinder Scout is accessible from the villages of Hayfield and Edale in the High Peak of Derbyshire. It is a popular hiking location and the Pennine Way crosses Kinder Scout and the moors to the north. This has resulted in the erosion of the underlying peat, prompting work by Derbyshire County Council and the Peak District National Park to repair it, in conjunction with the landowner, the National Trust. The plateau was the target of the mass trespass in 1932. 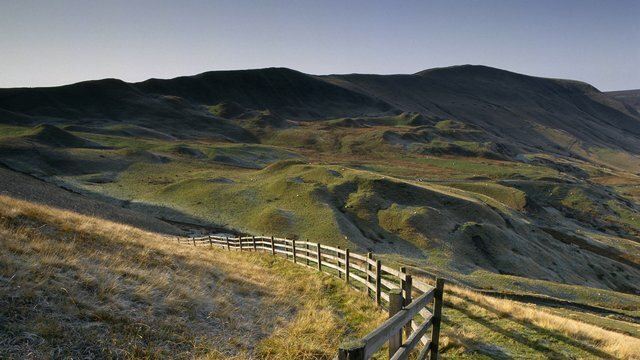 From the National Park's inception, a large area of the high moorland north of Edale was designated as 'Open Country'. In 2003, the "right to roam" on uncultivated land was enshrined into law, and this area of open country has been significantly extended. Parts of the Kinder Scout plateau (except legal rights of way) are still occasionally closed for conservation, public safety, grouse shooting or fire prevention reasons, but prior notice is generally given on the Peak District National Park Authority's website. Kinder Downfall is the tallest waterfall in the Peak District, with a 30-metre fall. It lies on the River Kinder, where it flows west over one of the gritstone cliffs on the plateau edge. The waterfall was formerly known as Kinder Scut, and it is from this that the plateau derives its name. Although usually little more than a trickle in summer, in spate conditions it is impressive. In certain wind conditions (notably when there is a strong westerly wind), the water is blown back on itself, and the resulting cloud of spray can be seen from several miles away. Below the Downfall the River Kinder flows into Kinder Reservoir. In cold winters the waterfall freezes providing local mountaineers with an icy challenge that can be climbed with ice axes, ropes and crampons. Some of Kinder's many gritstone cliffs were featured in the first rock-climbing guide to the Peak District, Some Gritstone Climbs, published in 1913 and written by John Laycock. The Edale Cross lies immediately south of Kinder Scout, under Kinder Low and on the former Hayfield to Edale road. It marks the former junction of the three wards of the Forest of Peak: Glossop and Longdendale, Hopedale and Campagna. The first cross on the site may have been set up by the Abbots of Basingwerk Abbey to mark the southern boundary of their land, granted in 1157. The date of the current cross is unknown, although a plaque beside it claims it to be mediaeval. At some point it fell down, and was re-erected in 1810, when the date and initials JG, WD, GH, JH and JS were carved into it. These stand for John Gee, William Drinkwater, George and Joseph Hadfield and John Shirt, local farmers of the day who raised the cross. The cross is a Scheduled Ancient Monument. Mermaid's Pool, a small pool below Kinder Downfall, is said to be inhabited by a mermaid who will grant immortality upon whoever sees her on Easter Eve. In 1932 around 500 walkers, mostly from Manchester, trespassed en masse and walked from Hayfield to Kinder Scout to secure access right to open country for all to enjoy forever. So walk in the footsteps of the trespassers and enjoy what others fought so hard for. Classified as Challenging, the walk is 8 miles long and should take about 5 to 6 hours. It is descibed as dog friendly. Start: Bowden Bridge car park. 1. From Bowden Bridge car park head towards Kinder Bank on the Kinder Road. The walk starts at Bowden Bridge the rallying point for the trespassers. There's a commemorative plaque here on the quarry wall. In 1932 most of the trespassers arrived on the train but the main protagonists camped in Rowarth, north west of Hayfield, and cycled to avoid the Police who intended to intercept them. 2. Spot the remains of Kinder village in nearby fields. Carry on towards Booth Bridge. 3. Pass Booth Bridge and sheep wash. They were constructed after the valley was flooded to create Kinder Reservoir. The 1932 trespassers would have walked on the road, but we can now use paths either side of the river. 4. Follow a bridleway up hill at White Brow alongside the reservoir until you reach the Snake Path at the foot of William Clough. Alternatively, take the route skirting along the reservoir enclosure wall to the bridge where there's an information panel. 5. From here, follow the path up William Clough, named after a cutler who worked here. Look for signs of iron smelting underfoot. During the mass trespass the ramblers left the path which was originally higher up the slope and became embroiled in scuffles with gamekeepers and water bailiffs. 6. Continue upwards to Ashop Head where the Pennine Way joins the path and turn right. Carry on along the ridge to Sandy Heys. This area was badly damaged by fire in 2003; peat moorland is a high fire risk after long spells of dry weather. All the way along the plateau admire the views over Yorkshire to the north, Cheshire to the west, Wales beyond. These views wouldn't necessarily have been clear in the 1930s due to industrial smokes from mill chimneys and coal fires. In July and August the landscape is colourful with flowering heather. 7. Marvel at the spectacular rock buttresses and cascading water of the Kinder Downfall. On a clear day, this natural amphitheatre can be visible for many miles. Kinder Downfall is often shrouded in mists, as the wind blows the tumbling water into the air. On sunny days a series of colourful rainbows arch over the rocks. 8. Continue along the Pennine Way to Kinder Low trig point, rising to over 2,000ft (630m). We're working to prevent the erosion of peat here by planting cotton grass to hold it in place and limiting water run-off. Below and to your right are Cluther Rocks, where roadside millstones used to be quarried. Curious rocks. Curious gritstone outcrops can be found on the southern edge of the Kinder plateau. Erosion of the peat soils here has been accelerated by the impact of man through air pollution, accidental fires and overgrazing. 9. Continue to the flag path, following the route to the left, to Edale Road. Turn right through the gate. Edale Road is an old packhorse route. Edale Cross marks the summit of the road. Continue downhill towards Hayfield. Moorland birds. Look and listen for moorland birds like the red grouse, curlew, golden plover and ring ouzel (or mountain blackbird). They feed on new heather shoots high up on the moors. 10. Leave the moorland and walk on a path through fields to the tarmac road at Coldwell Clough. Carry on, keeping the stream on your left. 11. Rejoin the metalled road at Ashes Farm and continue to Bowden Bridge car park. Edale is a village and civil parish in the Derbyshire Peak District, in the Midlands of England. The population in 2001 was 313 increasing to 353 at the 2011 Census. The Parish of Edale, area 7,030 acres (2,840 ha), is in the Borough of High Peak. Edale is best known to walkers as the start (or southern end) of the Pennine Way, and to less ambitious walkers as a starting point for evening or day walks, accessible by public transport from Sheffield or Manchester and with two pubs serving real ale and food. As spelt, the name is first recorded in 1732. Earlier recorded versions of the name are Aidele (1086), Heydale (1251), Eydale (1275), Eydal (1285) and Edall (1550). Historically, Edale was the name of the valley of the River Noe. From the Norman Conquest of England it was in the royal Forest of High Peak and at its centre is the Edale Cross, which marked the boundary of the three wards at the Forest, Campana, Hopedale and Longdendale. Settlement in the valley consists of several booths, originally established in the 13th century as 'vaccaries' (cattle farms) along the valley of the River Noe, which have since developed into the hamlets of Upper Booth (once Crowdenley Booth and Over Booth), Barber Booth (once Whitmorely Booth), Grindsbrook Booth, Ollerbrook Booth and Nether Booth (also known as Lady Booth and, formerly, Lower Booth). When the Hope Valley Line opened linking Sheffield and Manchester Piccadilly, the railway station to the south of Grindsbrook Booth was named "Edale", and the name came to be used for the settlements in the parish, rather than the valley as a whole. The valley is usually now referred to as the "Vale of Edale" or, much less frequently, as the "Noe Valley". Edale is the site of an historic cotton mill built in 1795 on the site of a corn mill and tannery by Nicholas Cresswell in partnership with James Harrison, Robert Blackwell and Joseph Fletcher. Workers were brought in from the towns and accommodated in cottages and in a nearby house called Skinner's Hall. Many of the women workers walked each day from Castleton over the thousand-foot Hollins Cross pass. The mill continued spinning cotton until around 1940 but then fell into disuse. It was restored in the early 1970s by the Landmark Trust who have since sold off all of the apartments. As well as being the start of the Pennine Way (the official start is the Old Nag's Head, a former smithy dating back to 1577), the village is surrounded by walking country which is excellent in its own right. The village is surrounded by hills: the plateau of Kinder Scout to the north, where the highest point in the parish is found, the Great Ridge (running west to east between Rushup Edge over Mam Tor to Lose Hill) to the south and east, Win Hill to the east (outside the parish), and Dalehead (Brown Knoll, Horsehill Tor and Colborne) to the west. Almost the entire parish is over 200m above sea level; only along the River Noe east from Carr House does the elevation drop below this level. The bed and banks of the River Noe from Barber Booth upstream to approximately the 320-metre (1,050 ft) contour constitute the Edale SSSI, cited for geological interest. The "important exposures" of the Edale Shales here contain fossils of technical interest. There is a youth hostel about a mile from the village centre, several B & Bs, and both pubs also provide accommodation. The pubs also provide food, and there are two cafés. In 2006 a new information and visitor centre was opened at Fieldhead. It was developed by the Moors for the Future Partnership and is owned and operated by the Peak District National Park Authority. Edale is also a popular camping village with two major campsites and numerous others in the surrounding area. The train service is reasonably frequent for such a rural area, and there is a limited bus service. The short but narrow, twisting and dead-end road to the village centre is not suitable for visitors' cars, and parking in the village centre is almost impossible. However, there is a large pay-and-display car park near the village hall, and parking for rail users at the railway station. Additional parking near the station is provided at busy times by the Parish Council. The Dark Peak is the higher and wilder part of the Peak District in England, mostly forming the northern Peak District but also extends south into its eastern and western margins. It is mainly in Derbyshire and parts of Staffordshire, Cheshire, Greater Manchester, West Yorkshire and South Yorkshire. It gets its name because (in contrast to the White Peak), the underlying limestone is covered by a cap of Millstone Grit which means that in winter the soil is almost always saturated with water. The land is thus largely uninhabited moorland plateaux where almost any depression is filled with sphagnum bogs and black peat. The High Peak is an alternative name for the Dark Peak, but High Peak is also the name of an administrative district of Derbyshire which includes part of the White Peak. The areas of Millstone Grit form an 'inverted horseshoe' around the lower uncapped limestone areas of the White Peak, enclosing it to the west, north and east. Hence the Dark Peak is said to cover the higher Derbyshire Peaks north of the Hope Valley, as well as the Western Moors stretching south to near the Churnet Valley, and the Eastern Moors southwards towards Matlock. The Dark Peak is one of 159 National Character Areas defined by Natural England; as defined by Natural England, the Dark Peak NCA covers 86,604 hectares (334 sq mi) and includes the northern block of hills approximately bounded by Marsden, Stocksbridge, Hathersage and Chapel-en-le-Frith, plus the eastern moors south to Matlock, but excludes the western moors between Chapel and the Churnet Valley, and the area around Glossop. An area of 31,852 hectares (123 sq mi) is designated as the Dark Peak Site of Special Scientific Interest (SSSI), which excludes the separately designated Eastern Moors. The SSSI extends over the borders into Greater Manchester and West Yorkshire. A large part of the SSSI is included in the South Pennine Moors Special Area of Conservation. Principal upland areas within the Dark Peak include Kinder Scout, Bleaklow (both of which rise to over 600 m (2,000 ft), and lie wholly within Derbyshire), Black Hill, the Roaches, Shining Tor and Stanage Edge. Over the years, a number of military aircraft have crashed on the Dark Peak, generally due to atrocious weather conditions. Due to the bleakness and emptiness of the high moorlands, their wrecks tend to remain untouched, and are often stumbled across by hikers in these remote places. There have been reports of ghost planes in the area for years. Many of the aircraft witnessed are wartime machines such as the Wellington Bomber, B-29 Bomber, Dakota and Lancaster. The reports of eyewitnesses are usually of a low flying, propeller-driven plane, which appears to be in difficulty before seemingly crashing into the moors. Several people who recovered items from the crash site were allegedly then visited by ghosts. The wild Pennine moorlands are of international importance for their populations of breeding birds and mosaic of habitats. Sites of particular interest include Mam Tor, with spectacular views, landslip and prehistoric settlement, the famous Snake Pass and Alport Castles in Alport Valley. Kinder Scout, where the Mass Trespass of 1932 took place, is the highest point in the Peak District and is the location for a lot of the National Trust's current conservation work in the Dark Peak. The Trust also owns the Penny Pot Café, Dalehead Bunkhouse and several farms in the beautiful Edale Valley. Edale village marks the start of the National Trail, the Pennine Way, that crosses 3 National Parks. The stone surfaced footpath from the car park to the top of Mam Tor will reward you with one of the most dramatic viewpoints in the Peak District. Classified as a Moderate walk, this is 3 miles long and should take about 2 hours. It is described as dog friendly. Start: Mam Nick car park. 1. Climb the steps at the top of the car park and follow the path alongside the road to a small gate and National Trust sign. Go through gate bearing left. Savour the dramatic views from Mam Tor over the Peak District. As you ascend the steps keep an eye out for the special stones in the steps, which hint at the iron age settlers who once lived on this hill. 2. Climb the stone steps until the ground begins to level out, not far below the summit of Mam Tor. As you start to climb the steps you can see, on the other side of the road, the thin and unstable beds of shale and sandstone of which Mam Tor is made. Take care! Cliffs and unstable edges. Please keep to the path. 3. Continue on the path up to the summit. This path is stepped and stone pitched and was rebuilt by our Estate Team, replacing the original track. 4. Once you've taken in the views from the trig point, follow the flagstone path north along the ridge until it gets noticeably steeper. 5. Continue to follow the path down to a small monument in a dip in the ridge. 6. Turn right, downhill, back towards Mam Tor. Take the right fork in the path, just before the trees, skirting around the woods. Continue on the path to the road. 7. Walk up the road, through a gate, to a broken road (caused by a landslide). 8. Continue up the broken road and pass through a gate and parking area. Turn left down the track to Blue John Cavern. Take a look in this show cave (not National Trust) to see the rare mineral after which the cave is named. 9. Pass the building that gives access to the mine entrance and go through a small gate and up a grassy path. Bear right at the top of the hill and go through a gate. Cross the field and road and take the left fork, uphill, to the entrance of another cave, Windy Knoll. Take care! Do not enter cave, as there have been recent rockfalls. 10. From the cave, cross the field to a small gate by the road. Cross this road and walk along the grass verge back to the car park. The NT hope you enjoyed your walk. There are miles and miles of footpaths across the areas of the Peak District that they care for. They cost £40 per metre to maintain and repair. Please help to keep them accessible for years to come by texting PEAK to 70123 to donate just £3 to their upkeep. Thank you. This is a charity donation service. You will be charged £3, plus one message at your standard network rate. The National Trust will receive 100% of your donation. The majestic scenery of Mam Tor has inspired many an artist. Photographers take stunning images of this wonderful landscape at all times of day, year and in all weathers. Some are available for purchase at their Penny Pot Café in Edale. End: Mam Nick car park. • Parking 20 yards from Penny Pot café. • Many free car parks (not National Trust). • National Trust car park at Mam Nick (SK123833). • Dogs must be on a lead at all times from early March to end July. • Most of the estate is on uneven terrain. • Special routes at Upper Derwent Valley. Transport: Edale (all National Rail) for Kinder Scout and Mam Tor; Chinley for Kinder Scout west; Hope for Losehill; Bamford for Upper Derwent Valley. Bus routes: from Sheffield, Bakewell and Manchester to Castleton, Edale and Hope Valley. Opening Times: Dawn till Dusk.